Good health, clothing, and healthy living environment are essential for a child to succeed in school. We are committed to individualized housing solutions. Whenever possible, our children live at home with parents, guardians, or family. Most often the home environment is unsafe or unhealthy, in which case we enroll the children in quality boarding schools. Because family is so important, we continue to encourage positive connections with family members for boarding school children. When children are transitioning from elementary to secondary or university, they need creative housing solutions such as temporary hostels, apartments, or group homes. Older girls enjoying a good meal in their hostel. Our children's shoes neatly organized outside their hostel rooms. Feat! Rukesh reading the latest news at Golden Gate College where many of our children attend 11th/12th grade. Our children receive dental care, braces, vaccinations, glasses and regular annual exams. When children need surgeries or unexpected health issues arise, we take care of them. 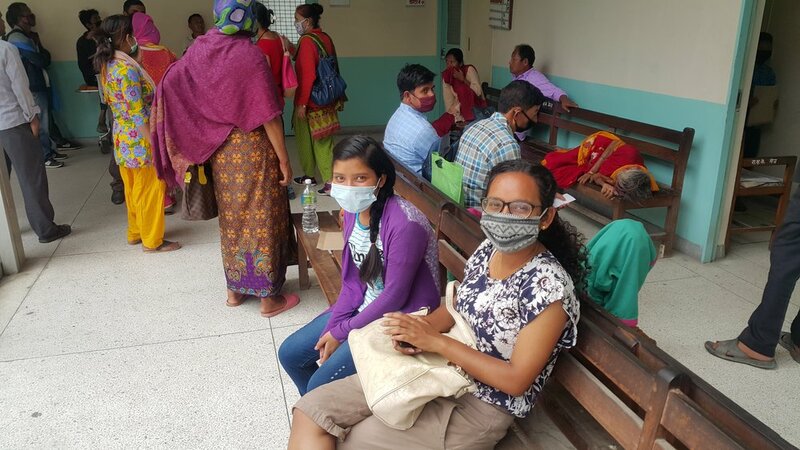 Our NGO partner staff take are often busy taking some of our 115 children to doctor appointments.Healthcare is not free in Nepal and often our families are unable to pay for medications or medical care. A child accompanied by our NGO staff receives treatment at a clinic. Leena (NGO Executive Director) taking children to the pulmonologist. Many of our children need extra clothing and personal items, which we supply. One of our favorite projects when we visit in the fall is to buy warm clothes and school supplies for the children. Sponsors and children have a fun day of shopping!